Many new knitting technologies at ITMA centered on energy efficiency and waste reduction, and shoe uppers offer an interesting new market for knitters. Many new knitting technologies at ITMA centered on energy efficiency and waste reduction, and shoe uppers offer an interesting new market for knitters. Sustainability was high on the agenda when the global textile machinery industry convened in Milan for ITMA 2015. With the theme, “Master the Art of Sustainable Innovation,” ITMA featured exhibits from the entire textile and garment making value-chain. Many of the recent developments from the industry’s knitting machine manufacturers have centered on increased energy efficiency and waste reduction. Knitting technology is always evolving, and improvements in machine manufacturing and graphic design software systems give technicians, designers and engineers more options to make technical, non-fashion related fabrics that were traditionally woven constructions. According Germany-based Mayer & Cie. GmbH & Co. KG (MCT), all of its machines on show combine a further increase in productivity, improved process reliability and produce consistently high- and reliable-quality knits. An important new feature is significantly reduced fresh needle oil consumption, which is the result of MCT’s SENSOBlueRS recycling process. According to the company, the patent-pending recycling process is based on cleaning and reusing needle oil that has already been used by the knitting machine in question. Used oil is cleansed of dirt particles in a filter unit housed within the machine, and then returned to the machine’s oil circuit. As a result, less fresh oil is required, and oil consumption can be reduced by up to 30 percent, depending on the machine. Germany-based Groz Beckert KG has developed a new generation of Litespeed needles for high-performance circular-knitting machines that can contribute to sustainable textile production in the circular knitting sector. The Litespeed Plus needle weighs in at just 0.6 grams and is capable of significantly lowering carbon dioxide (CO2) emissions. The company reports it has been extremely successful with the new generation Litespeed needles. The further improved shaft geometry reduces friction and wear substantially, which results in higher productivity, energy savings and a reduction in CO2 emissions. When Litespeed Plus needles are used, it is possible to lower the machine’s temperature and energy consumption by up to 20 percent according to Groz-Beckert. With a single needle set consisting of 3,000 needles, knitting mills in China have recorded CO2 reductions of 1.4 tons per year. In India, this figure was found to be over 2.4 tons. Germany-based Karl Mayer Textilmaschinenfabrik GmbH showed seven new warp-knitting machines, as well as new warp-knitted textiles and innovative warp preparation solutions, under the company’s motto of “We care about your future.” At ITMA, the HKS 2-SE, with a width of 130 inches and a gauge of E 36, was demonstrated knitting an elastic locknit charmeuse for sportswear. This new ergonomic machine design has a Low Energy Option (LEO) based on an improved interplay of drive technology, oil viscosity, heat-resistant machine components and operating temperature. According to the company, these features lower the energy consumption by up to 10-percent. It also features an LED lighting system and integrated camera system for complete fabric inspection provided as standard equipment. The four-bar high-speed tricot machine HKS 4-M EL with N pattern drive is now 25-percent faster than its predecessor, but offers a high level of flexibility according to Karl Mayer. The EL configuration enables the patterns to be changed very quickly and easily by inputting data at the machine’s display unit. In this way, the machine can process even small batches efficiently, and can reduce the amount of time needed to develop new and innovative fabrics. Moreover, the EL feature opens up completely new design possibilities due to shog paths of 2 inches and almost unlimited repeat lengths. Karl Mayer also presented two new machines in the lace sector, the TL 79/1/36 Fashion and the MLF 46/24. The new TL 79/1/36 Fashion machine is able to produce innovative Textronic lingerie, which the company claims is almost ready-to-wear directly from the machine with fabrics previously unseen in the industry. These eye-catching products include lightweight fabrics based on jacquard constructions featuring relief-like patterns with a distinct 3-D look, which is the result of a new way of incorporating the heavy liners. The TL 79/1/36 can make thick cord yarns look as if they have been sewn on, without any top cording. Moreover, the TL 79/1/36 Fashion can also be used as a fall plate raschel machine. All the standard Textronic patterns can be worked using the 76 pattern bars that are available without using the heavy cord option. The design of the TL 79/1/36 Fashion also makes it ideal for producing exclusive, high-end lace bands and panels for dresses, blouses and jackets. The new MLF 46/24 has an exceptionally wide 242-inch multibar lace machine with fall plate without jacquard bars, offering a high level of productivity for a low investment. The concept of this new machine is based on considerably increasing its speed compared to its predecessor at a gauge of E 18. The MLF 46/24, can produce several lace panels side-by-side, all-over-patterned textile webs, as well as bordered fabrics with long repeats. Karl Mayer also has improved and revamped the tried-and-tested concept of its Wefttronic® RS series and transferred it to the HKS MSUS. The result is the Wefttronic HKS. The weft-insertion system and the fabric take-up were at the heart of the steps taken to optimize this machine platform. The integration of the KAMCOS® 2 system and the implementation of the company’s own CFRP concept adds up to the new weft-insertion machine with an excellent performance ratio at speeds of up to 1,500 meters per minute. This new machine is also equipped with the unique gauge of E 40, which gives much more room for maneuver when designing products producing a fine interlining fabric. Three circular knitting companies presented spin-knit machines. The spin-knit machines spin yarn from rovings that are mounted close to the machine then subsequently knit the spun yarn. This can shorten the production process making separate ring spinning, cleaning and rewinding steps no longer required, which lowers production costs. This also leads to a significantly lower investment in machinery. The spin-knit machines also are similar in size to conventional knitting machines, which saves space and energy while also producing less CO2 and waste. Germany-based Terrot GmbH unveiled a new machine that offers customers an opportunity to spin yarn and knit fabric on the same machine. The Terrot F132-AJ direct spin-knit process uses an air-jet spinning system. However, it does not mount the rovings, clearing or drafting units or the spinning nozzles on the knitting machine like other spin-knit machines. Instead, there is a creel type arrangement on three sides of the machine, which houses the complete roving to spinning process. The yarns are spun by the side of the machine and then fed in. The F132-AJ independent spinning unit can be fitted to all Terrot single-jersey and double-jersey machines. The direct spin-knit system even is suitable for high system densities and large diameters of up to 120 feeders, and can be used in gauges from E 20 to E 36. The modular spinning system can be fitted with 24, 32 or 40 spinning heads per unit; and has an integrated flyer, integrated fluff removal and integrated monitoring process. The fabrics have a high quality look and feel, soft handle and good dyeability with rich colors. Elastane plaiting is also possible with the new Terrot system. The F132-AJ has a speed factor of up to 600 — 20 rpm, 30 inches — and offers unfinished fabric output of up to 360 kilograms over 24 hours. According to the company, the new process requires 40-percent less space, up to 50-percent energy savings, up to 30-percent lower investment cost and up to 50-percent lower production costs. Taiwan-based Pai Lung Machinery Mill Co. Inc.’s SPINIT system was the third machine on display that combines spinning and knitting. The process commences with a stream of parallel slivers that are fed through a drawing frame via a spinning unit into a single-jersey knitting machine. Three steps of roving frame, ring spindles and winding frame in the traditional spinning process have been replaced with this new Pai Lung development. A false twist is applied to spin the yarn. The manufacturer says that the absence of conventional coned yarns in knit feeding results in a final knitted fabric that is very soft with silky brightness. Additionally, the cost of knitted fabric produced using SPINIT is significantly lower than when using traditional processes. Pai Lung estimates a savings of up to 37 percent in equipment costs, power supply and labor costs. With an increasing market demand for specialty machines, another twist on rovings is the Orizio PLE from Italy-based Orizio S.r.l. This is an electronic single-jersey machine for the production of high pile fabrics with multiple colors and large-dimension patterns targeted to niche markets. It is configured in a 24-inch diameter with 18 feeders, or a 38-inch diameter with 24 feeders. Gauges are 10, 12, 14 and 16. The PLE model is capable of up to six color reversible jacquards with one side incorporating the jacquard as a pile fabric. Piqué, fleece and honeycomb ground structures also are possible with double-sided fabric that includes jacquard pile on the other side. At the Pai Lung booth, the company introduced its new circular knitting PL-KRN2.5CJ with 28-gauge dial and 14-gauge cylinder knitting platform under its new fabric name called Active mesh. Active mesh is a single-jersey with eyelet jacquard fabric made by a full jacquard rib-mesh machine. Different sizes of eyelet holes can be knitted using the machine’s pelerine needle system; even different densities of jacquard fabric can be presented. According to Pai Lung, the machine is able to produce a larger and more regular shape of mesh hole when compared to the holes made by normal transfer spring needles. The company reports its ventilation and moisture control properties make the fabric suitable for body mapping applications and activewear design. Monarch Knitting Machinery Corp., Monroe, N.C., presented a brand new machine capable of knitting mattress-ticking fabrics featuring several woven product properties. Monarch’s M-LEC6DSI — a 38 inch, 28 gauge machine with 72 feeds — is its first 28 gauge dial selection machine for mattress-ticking fabrics. The machine can knit high-definition, multi-colored jacquard designs and the latest woven look fabrics with stretch and soft hand. The machine offers three-position needle selection — knit, tuck and miss — on the cylinder, and two-position on the dial — knit and miss — with SS actuators, which allows designers to create the latest generation of mattress ticking fabrics. According to Monarch, the size of its SS actuators makes the machine 20-percent more productive than its predecessor. On this model, reliable needle selection is guaranteed by a newly designed needle jack connection system, which helps with the production of high-quality mattress ticking as the non-selected yarns are knitted to the back side. This gives a very clean appearance and allows the use of darker yarns without fear of grin through. 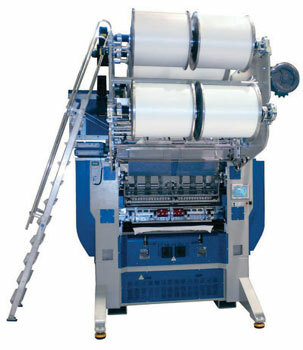 It also ensures that the borders and outlines of jacquards are exact as the yarn tension is easily controlled. The M-LEC6DSI is available on 36-inch-, 38-inch- and 42-inch-diameters and in gauges ranging from 12 to 28. It is also equipped with Monarch’s latest M frame, which lends itself to high-speed operation and a quick-change facility for cylinder and dial. As well as full double-sided jacquards, it can also produce double blister fabrics. Terrot also introduced a mattress-ticking machine called the UCC594M. This powerful electronically controlled double-jersey machinery is unrivaled in its high yield, and has already become an integral part in the machinery of leading producers for mattress fabrics worldwide, according to Terrot. The model was displayed with high industrial frame C6/3. Model M-9MEQG from Monarch is a double needle bed, quarter gauge machine, featuring 7 gauge on the cylinder and 28 on the dial, which enables the machine to produce fabrics with different gauges on the two faces suitable for a variety of end-uses from clothing to outerwear, as well as sporty and technical fabrics. The machine easily can be converted into a normal interlock machine and is equipped with the new base type M, optimized in size and technology. Sinkerless technology allows a stitch formation undisturbed by any mechanical movement to produce a fabric completely sinker line free. Orizio exhibited sinkerless technology in a 20 to 80 gauge version with 90 feeds on 30-inch-diameter. The JFP model produces high quality jersey and jersey with spandex for sinkerless stitch structure fabrics. The machine is equipped with the Orizio LC open frame with electric cutter, pneumatic roll expulsion and a brand new control system with touch screen. For the first time at ITMA 2015, Terrot Germany exhibited in a joint booth with Terrot Italy, the owner and manufacturer of the Pilotelli brand. The SL-4 version, the latest generation of Pilotelli’s sinkerless range, incorporates newly engineered technology patented by Terrot. With its proven ease of use and new qualitative influence by Terrot, model JVCE-4 3.0 SL-4 in open-width frame T.A.7 was showcased. The Pilotelli sinkerless technology guarantees high output and low maintenance, according to Terrot. There have been many developments in weft-knitting machine technology in the four years since the last ITMA — machines have become more specialized and universal at the same time. Complete and integral garments, industrial, medical products and footwear have been a driving force for new developments. Technical features driving innovation include spacer fabrics, weft insertion, air splicing and inverse plating. Inverse plating offers designs of special single-jersey jacquard technology, which used to be knitted by special handwork or high-value intarsia machines. The yarn plating position changes during the carrier’s movement across the bed. The application of plating jacquard technology in jersey can replace some of simple color intarsias, finer gauge of double-jersey jacquard, links-links plating, and reduce certain after treatment like in some embroidery or printing processes. Weft insertion allows woven-like fabric appearances and reinforcements. Inlay fabric production involves inlaying and patterning a weft into a knitted fabric base. This can be used for decorative purposes giving the effect of embroidery. Weft insertion can restrain the characteristics of the stretch of a knitted fabric; this facilitates the insertion of metallic, conductive, and monofilament yarns or other special materials. Spacer fabrics or two-faced fabrics represent a class of knits comprised of two main layers connected by yarns transformed in tucks or loops. 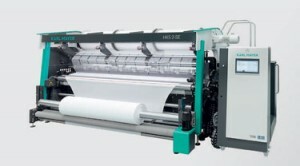 Electronic weft knitting machines with two needle beds have the ability to create individual layers of fabric, held together by loops or tucks, or by separate fabrics as connecting layers. In 1995, Japan-based Shima Seiki Mfg. Ltd. introduced the world’s first WHOLEGARMENT® knitting machine, capable of producing a garment in its entirety with no seams. It was revolutionary technology, and Dr. Shima believes this is now an innovation coming of age. Just as a 20-year old, who comes of age assumes new responsibilities as an adult and begins contributing to society; Wholegarment is likewise expected to take on an instrumental role in mainstream production in the coming years. Although by its very nature, Wholegarment is considered one of the most sustainable forms of garment production with minimal dependence on labor, materials and other resources, Shima Seiki has proposed several novel ways to produce Wholegarment knitwear even more efficiently by exploiting 3-D shaping and tubular knitting characteristics. Shima Seiki announced a new flagship machine, the MACH2XS, which features the company’s original SlideNeedle™ on four needle beds for high-quality Wholegarment production in all needles, quick carriage returns with R2CARRIAGE® combined with a maximum speed of 1.6 meter per second for high productivity, and i-DSCS+DTC® Digital Stitch Control System. The S series is equipped with a new spring-type moveable sinker system. Dimensional fabrics and fléchage can be knit with ease, expanding the range of knitting. For example, frills, gathers and other decorative elements that previously required sewing can now be knit integrally as part of the garment. Deeper necklines can be knit also, permitting more fashionable designs to be produced. This new machine can be equipped with the Air Splicer option for supporting multi-color knitting by splicing together yarns at high-speed. 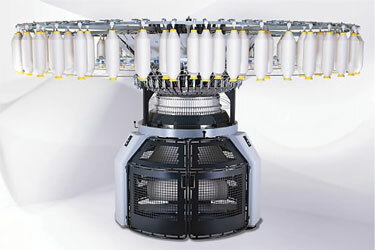 The 15L machine also features a large-hook SlideNeedle mounted in 15-gauge pitch for production of fabrics in the 10 to15 gauge range, and is equipped with a new inlay carrier option that enables insertion of weft yarns for producing brand new flat knitted fabrics with woven pattern effects with light weight, applied to such items as knit jackets and skirts known collectively as Airdrobe® — Air + Wardrobe — garments. 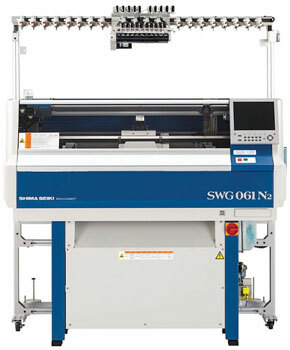 The SWG-Mini, Shima Seiki’s compact line of Wholegarment machines allows customers to participate in the Wholegarment market with minimal investment. The SWG061N2 in newly developed 13 gauge features a 24-inch knitting width, for such items as gloves, socks, hats, mufflers, neckties and other small accessory items, as well as for the production of 3-D knitted shoe uppers. 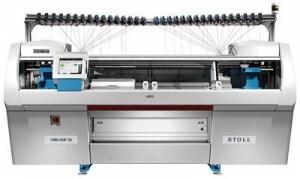 The Weft Insertion SRY183LP-SC features loop presser beds on a 72-inch knitting width developed to take advantage of inlay fabric patterns that have proven popular with circular knit manufacturers and even textile manufacturers, by supporting the standard 150-centimeter width of woven fabric bolts. Inlay fabrics knitted on SRY share characteristics with those of both knits and wovens, the fusion of which is described by Shima Seiki as KNEAVE® fabric. To program the new machines, Shima Seiki developed the SDS-ONE APEX3 3D design system that provides comprehensive support for the entire knit supply chain from planning and design to production and sales promotion. With even more powerful graphics and functions, simulations of even higher quality are used to produce ultra-realistic virtual samples that cannot be distinguished from actual samples. With virtual sampling, the costly time-, energy- and resource-consuming sample making process can be minimized for quick and efficient evaluation and shortened lead times in manufacturing. Virtual samples can also be used in presale events to determine consumer demand before actual production begins for optimization of inventory. Germany-based H. Stoll AG & Co. KG presented four types of the newly engineered ADF — Autarkic Direct Feed — machines, which offer complete freedom in design and production. The yarn carriers are independent of the carriage and can move both horizontally and vertically. Thanks to this innovative yarn carrier technology and a variety of knitting techniques, this machine creates almost endless possibilities for pattern and color combinations. The CMS ADF 16 machines enable a cost-efficient entry into ADF-technology with ADF- knitting in coarse gauges. All CMS ADF 16 machines are equipped with high ADF technology and can be distinguished from CMS ADF 32 models by the quantity and position of yarn carrier rails. The CMS ADF 32 BW emphasizes with the inlay presser foot with reverse plating in one system. The yarn carrier knits and weaves-in in one stroke. The most important benefit of this machine type is the reverse plating, which causes reduced runtime and thus provides a high level of productivity and enhanced economic efficiency. New pattern techniques such as knitting and weave optics are possible. One is the new patented knitting technique Stoll-ikat plating®. It is possible to knit inlay technique with all 32 yarn carriers. Another highlight with the ASCON® feed wheel controlled by yarn tension. 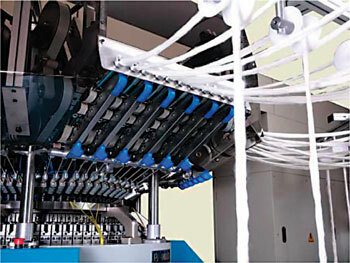 This kind of machine is most suitable for weave-in fabrics because of its integrated weave-in device. Stoll has expanded its gauge range further, adding gauge E 1.5 and gauge E 2.2 for the extra-bulky knits and extra-chunky yarns that previously demanded hand knitting. Gauge scalability now extends stitch optics from gauge E 1.5 to gauge E 5; yarns down to 0.7 Nm can be used. Moreover, the industrial knitting machine offers countless design options: jacquard, intarsia and structured knits — combined with shaping at tributes in Fully Fashion technique. One of the largest machines was the CMS 822 HP with an enormous working width of 84 inches. The possibility of combining the carriages really makes this machine a highlight. The machine is equipped with the Ascon yarn length-measuring device. The stitch quality and size are monitored and adjusted automatically. Potential yarn fluctuations are equalized automatically reporting of actual yarn consumption. Switzerland-based Steiger Participations Sa exhibited three new flat-knitting machines in a booth shared with its China-based partner CiXing. The Steiger C2.185.SCP uses the company’s recently developed compound needle feature and a new yarn feeder with both horizontal and vertical control. The new technology was shown in freegauge 2.5-2 knitting a coarse gauge hand knit look seamless sweater with all needles. The Taurus 2.170XP also features the compound needle and a storage punch. It offers complete garment knitting, multilayer knitting and complex inlay and intarsia constructions. New features include the independent motorized clamps and 24 vertically and horizontally motorized yarn guides, which allow the creation of a range of new patterns such as intarsia, inlay and plating. The Taurus is available in gauge E12 and in a working width of 170 cm. Also new is the Antares 3.130, which comes equipped with the open carriage system, direct threading that allows knitting with any type of yarn at high speeds, reduced tension and a smaller yarn path between the cone and the needle limiting friction. This model also is equipped with the patented friction take-down system, which allows a wide range of exclusive patterns with circular knitting effects as well as horizontal cable and incorporated elements. The Antares also features the vertical and horizontal motorized yarn guides and the Steiger Dynamic Sinker system. According to Steiger, these features, which cannot be produced with a traditional takedown system, offer improved productivity and fabric quality. Many large sportswear companies are now producing integral shoe uppers on knitting machines. Machine makers are competing for this relatively new untapped market. In addition to the industry leaders, there were a few other companies venturing into this highly lucrative market in differing ways. One of the more impressive machines for footwear on display was Japan-based Matsuya Industries’ Super-J 212 SC Professional Fully Fashion Shoe Cover Machine. The 48-inch needle bed machine uses a patented three-way sinker system and a melt yarn to enable a tight stitch appearance for a higher quality look. Korea-based Keum Yong Textile Machinery has engineered a double-jersey, electronic full jacquard circular knitting machine with rib-mesh that can be used for the production of shoes. The KCMJD-169S features electronic individual needle selection and unlimited patterning, as well as needle selection in both the cylinder and the dial by means of a WAC actuator knitting in three technical ways — knit, tuck and miss — on the cylinder and two on the dial allowing the production of rib-mesh transfer jacquard knitting structures. Italy-based Santoni S.p.A. had two machines. The MEC-MOR Variatex CMP was demonstrated knitting rolls of fabric with outlines of shoes knitted in — the fabric is then cut and sewn to make-up the shoe. The company also showed its SWD6/2J WARP knitting machine making shoe upper blanks. The Santoni/Lonati Group had one of the biggest booths at ITMA with a total of 60 machines on display showing their complete range, which includes Santoni Seamless machines, large-diameter circular-knitting machines, circular-knitted garment-length Mec-Mor machines, warp-knitting double needle bar Raschel knitting machines, Santoni automatic sewing machines for hosiery, Tecnopea boarding and packaging machines, Lonati socks and pantyhose machines, Sangiacomo and Matec sock machines, and Dinema software. On the upper floor of the booth, the companies had collections of items that can be knitted on the machines. Seamless knit technology provides highly elastic knit outerwear, underwear and elastic sportswear technology, in the neck, waist, buttocks and other areas where seams might be uncomfortable. In addition, seamless knit garments can shape and support the body. 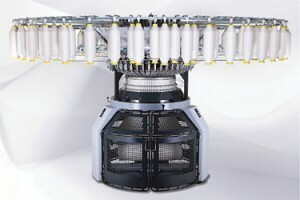 Santoni’s MEC-MOR Variatex CMP Garment Length Circular Knitting Machine complete with rib border separation is a double-jersey circular machine with open variable panel — Variatex Technology — for the production of garments in weft knitting. The variable width of the fabric panel allows a set number of working needles for the required product, which in turn enables one single machine to produce all the sizes without waste. This 33-inch-diameter machine has gauges ranging from E 7 to E 20 with 12 feeds. It is designed with needle-to-needle selection on three technical ways both for the cylinder and for the dial. Each feed is equipped with a combined knitting/transfer system, therefore at every revolution of the cylinder the programming system can set each single feed either as a knit feed or as a “transfer feed,” achieving every knitting stitch composition with maximum productivity. Santoni’s SM8 TOP2V machine is an electronic single-jersey circular machine with eight feeds and two selection points per feed. The machine is designed to efficiently produce seamless underwear, outerwear, beachwear, sportswear and sanitary wear. TOP2V consumes 15-percent less energy and offers 30-percent more productivity than the current model according to Santoni. This machine is ergonomically designed and equipped with new parts including yarn finger groups and sinker cap for natural yarn plating. Hosiery machine specialist Lonati S.p.A., Italy, has developed a new machine for the production of one-piece pantyhose. The LB-OP on show had a 4.5-inch diameter with 448 needles in gauge 75. Essentially, knitting begins at one toe-end and moves up, across and then down, while leaving a hole at the top for the auto-sewing of the waistband further down the production process. With a production time of 4 minutes and 55 seconds, a key issue here was producing a pair of pantyhose with the necessary stretch properties. Lonati’s solution here is to offer the larger-diameter machine so that the hosiery can be both longer and wider providing the additional volume that was necessary. From the knitting machine, the pantyhose are then transferred manually to the Santoni Flat-Lock machine for the addition of the pre-knitted waistband and then on to the TC Smart, which has been specifically designed for pre-assembled pantyhose or one-piece toe seaming. The TC Smart operates on both toes with a perfect round seaming fish-mouth as is demanded in high-quality hosiery. Lonati also presented the latest addition to the toe-closing options, the DC88 2 feed model, which is capable of knitting both links and jacquard. This two-feed model builds on the launch of the DC 88 single-feed model launched in 2013 for the production of men’s and children’s socks and tights in plain fabric, derby, links and striped fabric with short yarn ends staying inside the sock. Available in 3-inch, 3.5-inch and 4-inch-diameters; and in gauges 14 and 18, the DC88 has fewer parts than its predecessor. It has no bolt cams or picker, and electronic needle-by-needle selection takes place with a single actuator. It also has an electronically controlled stitch adjustment using a stepping motor mounted directly on the knitting cams. With toe closing S by S an option, the second feeder on the DC88 is located between the cylinder and the toe-closer with stitch transfer and jacquard as well as links-links socks now possible, giving sock manufacturers a greater range to choose from. Italy-based Busi Giovanni S.r.l. has added to its range of knitting machines for the medical sector with the launch of the Busi Medical Pantyhose and the Medical Terry Pantyhose machines. The Medical Pantyhose machine is a high production single cylinder machine with latch needles in the dial for the production of true rib or plain stitch medical compression socks in compression classes 1, 2 and 3. The machine is equipped with full electronic control and features two feeds for plain and rib fabric, as well as for laid-in elastic fabric. The compression graduation is achieved both through the automatic stiffening that can be activated on all step motors and through the graduation of the covered elastic yarn feed. Editor’s note: Dr. Andre West is an assistant professor at North Carolina State University’s College of Textiles, Department of Textiles and Apparel, Technology and Management, Raleigh, N.C.